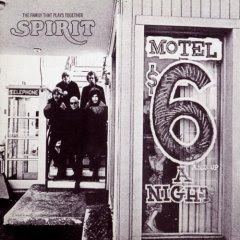 Part of the great San Francisco rock boom of the 60's which gave us Jefferson Airplane and The Grateful Dead, Spirit never achieved the long-lasting success of either of those bands, and still remain under appreciated to this day. They started as a psychedelic rock band, but gradually incorporated jazz and world music with each new album. Unquestionably, they were an acquired taste with their experimental excursions. Remarkably, they were produced by the legendary Lou Adler, who seems to have had his hand in so many influential artists from The Mama and Papas and Johnny Rivers to Carole King and, well, Cheech and Chong. There was no way this song was not going to blast off. It was just too good. I am very surprised that more bands have not covered this, as this was about as perfect a 60's rock dance tune as there could be. Periodically, there'll be a video of something called Spirit 0f '84 on VH1 Classic, which seems to be most of the band playing "Got A Line On You" with a more percussive beat and other musicians sitting in (most visibly, ex-Steely Dan guitarist Jeff "Skunk" Baxter). The Georgia garage rock band The Woggles do a terrific version that can be heard once in a while on Sirius Satellite Radio's Underground Garage channel. But I did find two other notable covers which I have put below the original -- Alice Cooper in a heavy metal crank from the Iron Eagle II soundtrack from 1988, and blind guitarist Jeff Healey opening a 2005 Germany show with an absolute smoking overdriven version with his band. Thanx man. I saw the '1984' video on VH1 and I said to myself "this man looks like Jeff Baxter" So I started searching on the internet if JefF Baxter was credited somewhere for this performance, and I found your post. I love this song and I loved It when I was ..12! Catchy pop Jimi Hendrix Experience rip-off in every way, plain and simple. Any idea where the video of "I Got a Line on You" with Skunk Baxter and others sitting in might be found? Seriously, it's up there with the greatest rock performances ever.